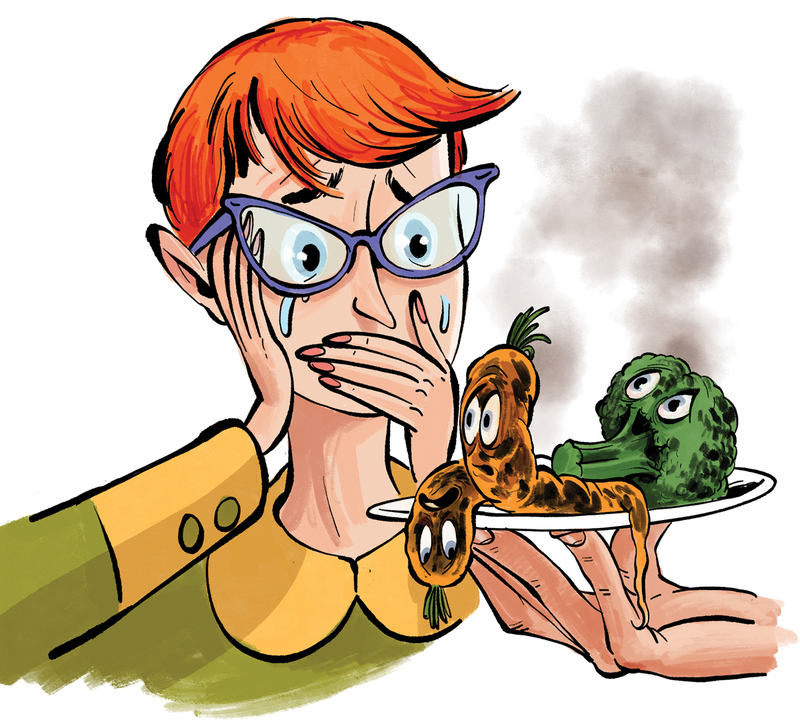 The best carrot I ever ate wasn’t charred, blistered, sous-vided, dusted with ashes, or suffering any of the indignities chefs now routinely submit our vegetables to. The best carrot I ever ate came right out of the ground. I grew it myself in fertile soil. I pulled it out by its lush leaves, rubbed it against my jeans to brush off some of the earth clinging to its deep orange body. I bit into it while I still stood in my garden, and it blew my mind. Restaurants take great pride in the produce they source from local farmers, yet they rarely can resist the urge to overdo it. Does charring improve the taste of broccoli? Of course not, but that preparation appears on countless menus, daring you to protest such abuse. I just read a tweet describing the preparation of a beet: “sous vide for three hours then fried and served with goat cheese, mint, beet gel, and pumpernickel crumble.” Talk about gilding the lily! Obviously, chefs must do more than slice and dice their veggies or boil them for a few seconds before dumping them on my plate. But no vegetable that is smashed, smoked, or rendered unrecognizable in a marmalade will ever make me as happy as a bowl of crudités over ice. I first met Alex Brounstein in the murk of the Sweet Auburn Curb Market in 2009. He had just decided to open a lunch counter that would give new life to the market, a meticulously researched concept that focused on high-quality burgers. He served a freshly ground blend of chuck and brisket on soft potato rolls made by Martin’s and accessorized them with housemade sauces and toppings such as New Mexican green chilis. He projected cult movies such as Faster, Pussycat! Kill! Kill! and Attack of the Killer Tomatoes on the wall behind a counter mobbed by young people. Brounstein had just turned 31 when he launched that first Grindhouse Killer Burgers, a location he later sold as a franchise. He now owns Grindhouses on Piedmont Road and Memorial Drive, as well as in Decatur and Athens. He plans to open another in Brookhaven, and there are two franchises at the airport. Six months after Brounstein’s foray into an industry he helped change irrevocably, his buddy Ian Jones, who had graduated from Georgia State with ambitions to become an architect, took over a former pizzeria in Inman Park and opened Victory Sandwich Bar. Jones’s hipster take on the sandwich business became the essence of cool, with a Ping-Pong table, old B movies, slushie machines dispensing frozen Coke-and-whiskeys, and a slew of tiny, creative sandwiches. He also was 31 at the time and understood that there was a new generation pining for fun and informal places to eat. Together with business partner Caleb Wheelus, who is “one school-generation older,” Jones moved Victory to a larger spot in Inman Park and opened another in Decatur. Those were followed by Little Trouble on the Westside and S.O.S. Tiki Bar, also in Decatur. Ironically, he’s now working on a “grandpa bar” near Krog Street on DeKalb Avenue.